There is kick-pants included with this dress. 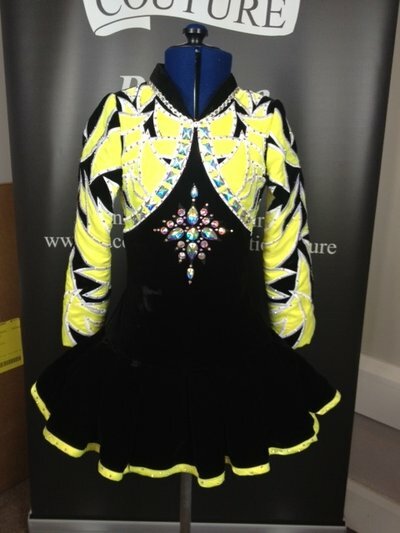 It is a Beautiful black silk velvet dress with bright yellow twinkle applique and €150 worth of swarovski crystals. Made by Celtic Couture. Second hand. Would suit 7-9 year old . Refunds will only be given if the dress hasn’t been danced in and if we receive notice of the return within 1 week of the customer receiving it. Asking Price: €800.00. Shipping costs are not included in the asking price .Will accept returns and refund the cost of the dress, buyer to pay all shipping costs.